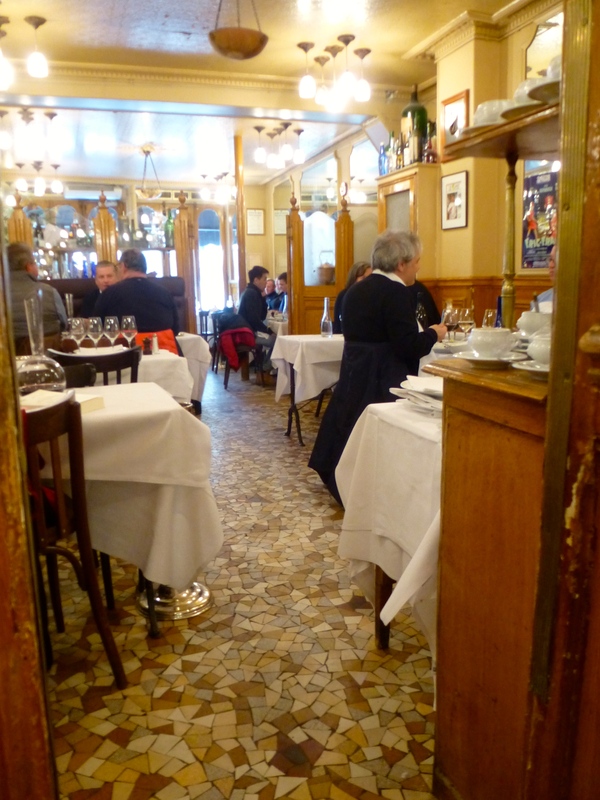 A quick post with two more lunches in Paris (one more to go today, at my old favorite Chez Denise, and I’ll report later on that and our lunch in Chartres). 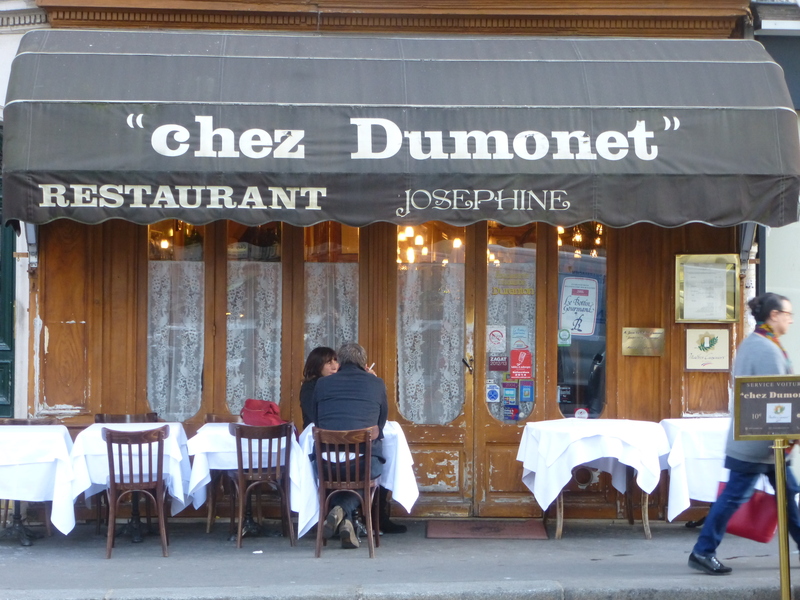 The unanimously voted Best Lunch of the Trip was at the venerable old bistro Josephine Chez Dumonet near the Tour de Montparnasse. 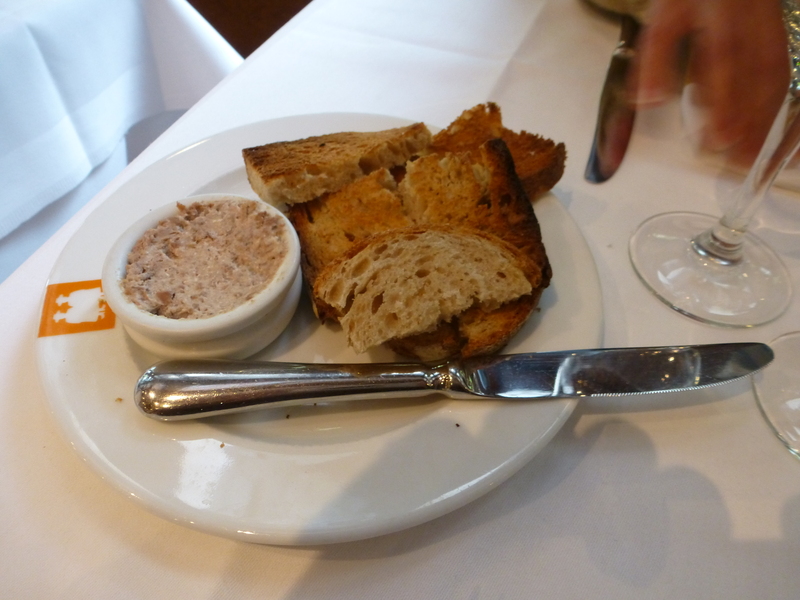 Appetizers: foie gras (a half portion) and smoked salmon (a half portion, and fantastic). Due to my having sent a bottle of wine back because it was corked, the appetizers were half eaten before I remembered to photograph them. 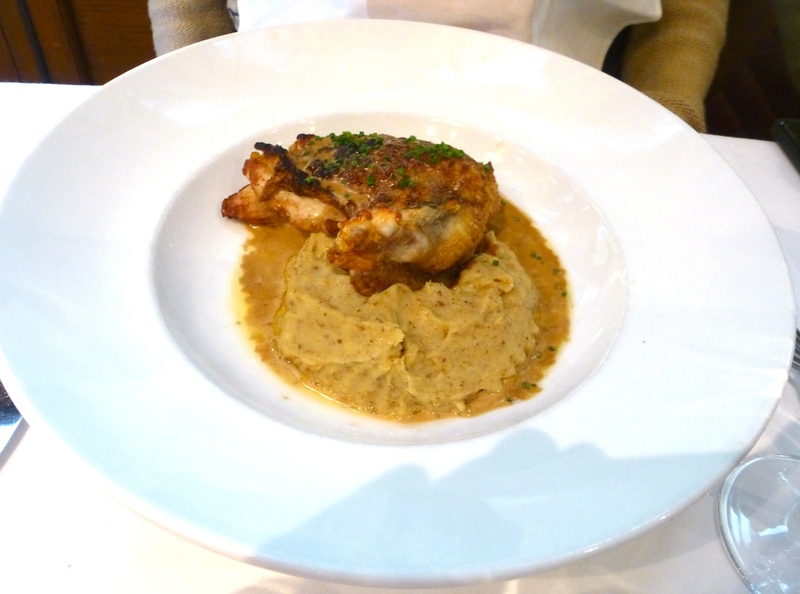 One good thing about Josephine’s is that both entrées and plats come in half portions, and believe me, you don’t want more than that! 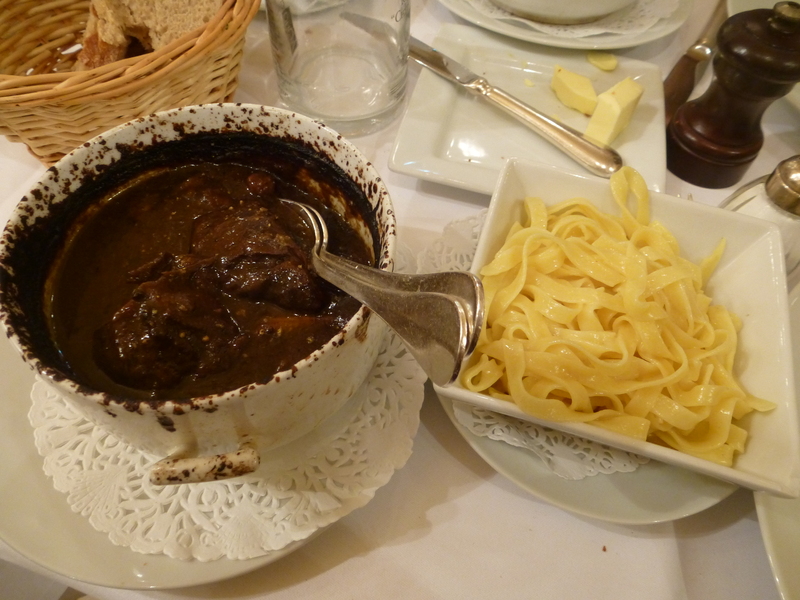 The house special is bouef bourguignon, an intensely rich beef stew cooked with wine and vegetables. It’s served with house-made noodles, over which you slop the beef and sauce. 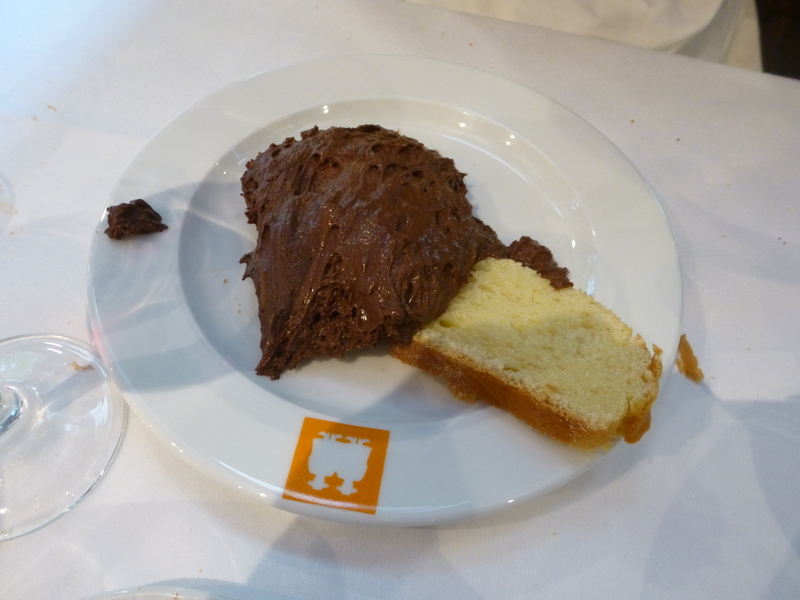 This is a half-portion, and believe me, it’s enough! A view of the kitchen (yes, we were put in the “foreigners” section behind the partition, a bad habit of the restaurant. 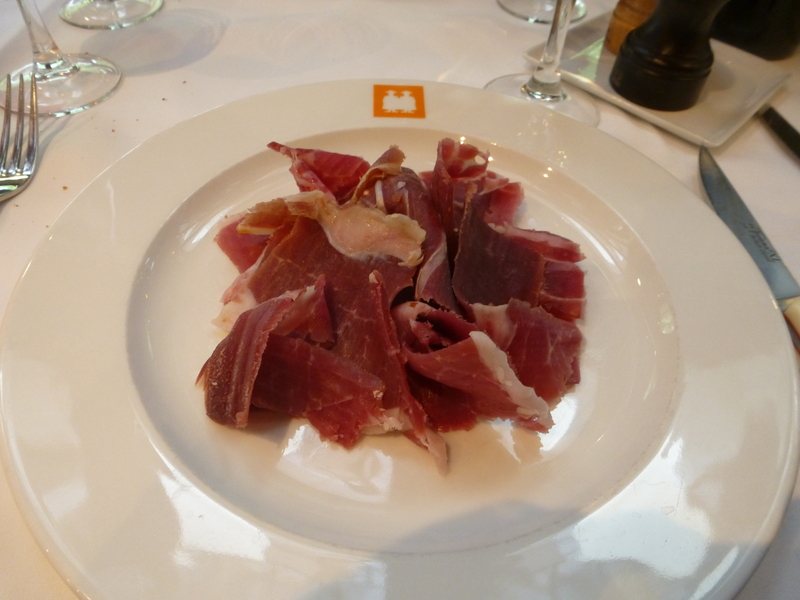 But I’m not complaining, as they treated us very well and the food was fantastic. 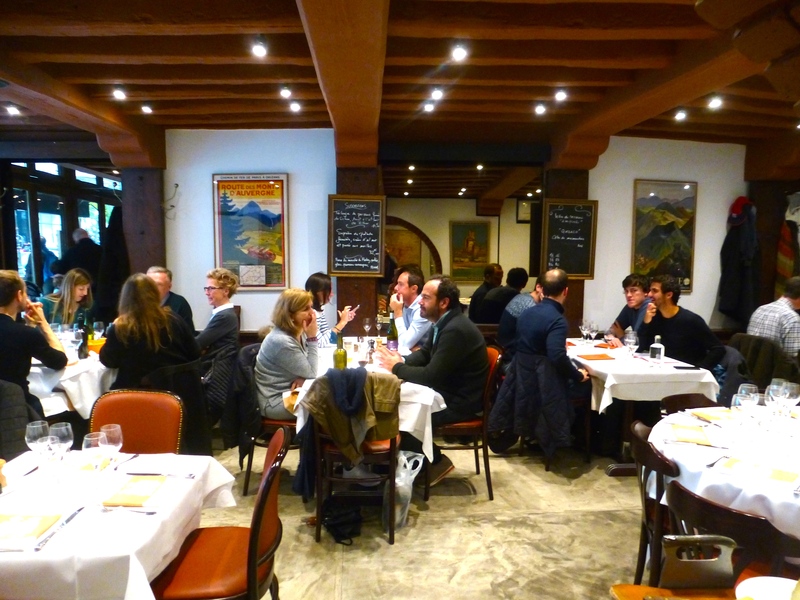 Saturday lunch was at Ambassade Auvergne, specializing in the hearty food of this region in south-central France. It’s on an unprepossessing street near the Centre Pompidou near Les Halles. 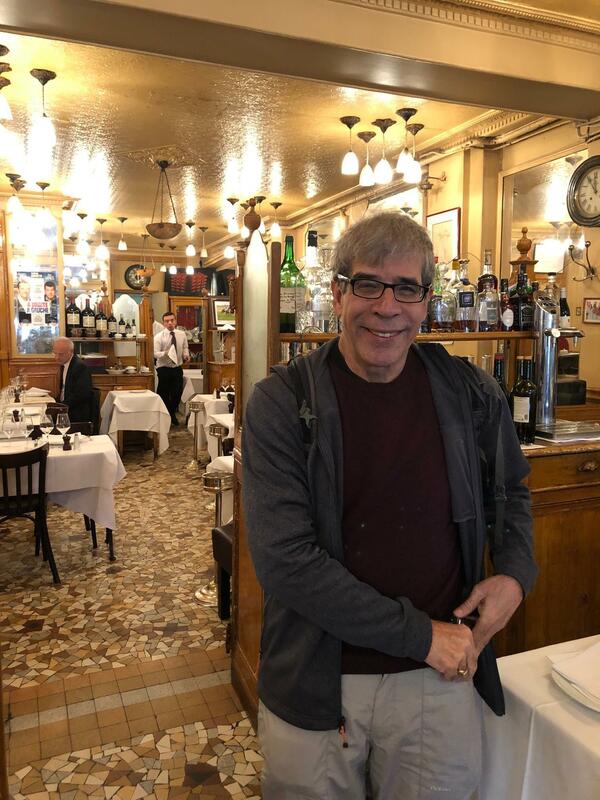 I ate there fairly regularly during my first sabbatical nearly 30 years ago, and was curious to see how it had held up. Very well, it turned out. The inside, though, is warm and inviting. 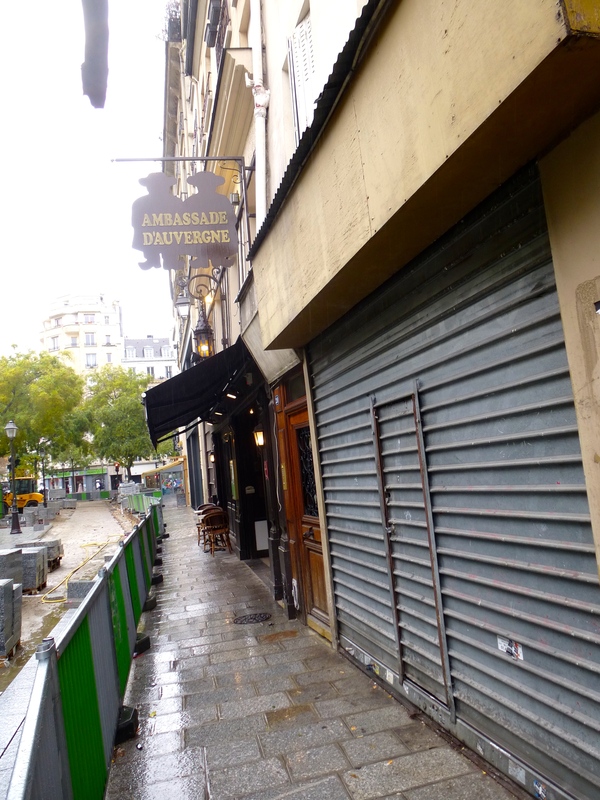 Although the place is frequented by tourists in spring and summer, we were the only non-French diners in the restaurant. In fact, during all of our dining in this off-season, we found only a single American in a restaurant, and he was a frequent visitor to the city and had lived here as a wine writer. 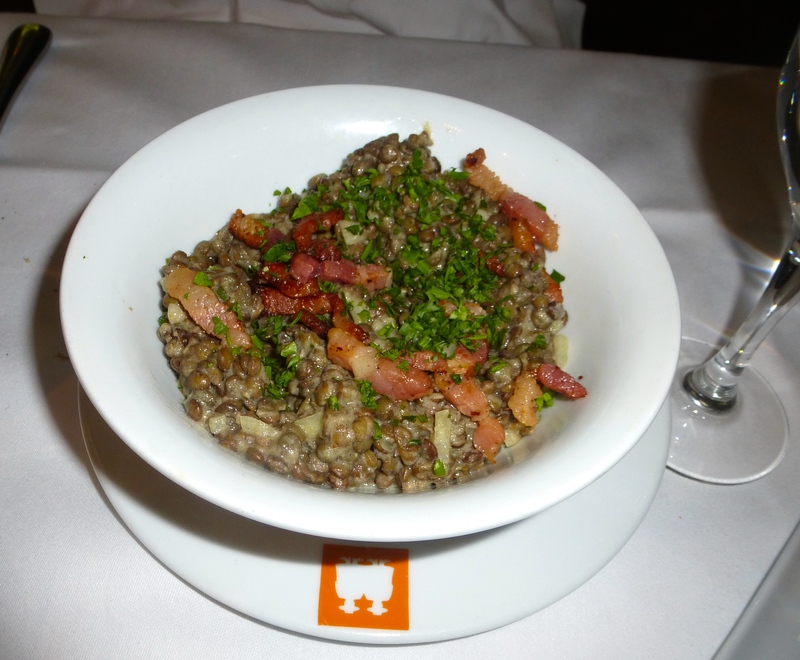 Entrées: The local salad with green lentils, ham, and a lovely mustardy dressing. This is a house special, and it’s terrific. 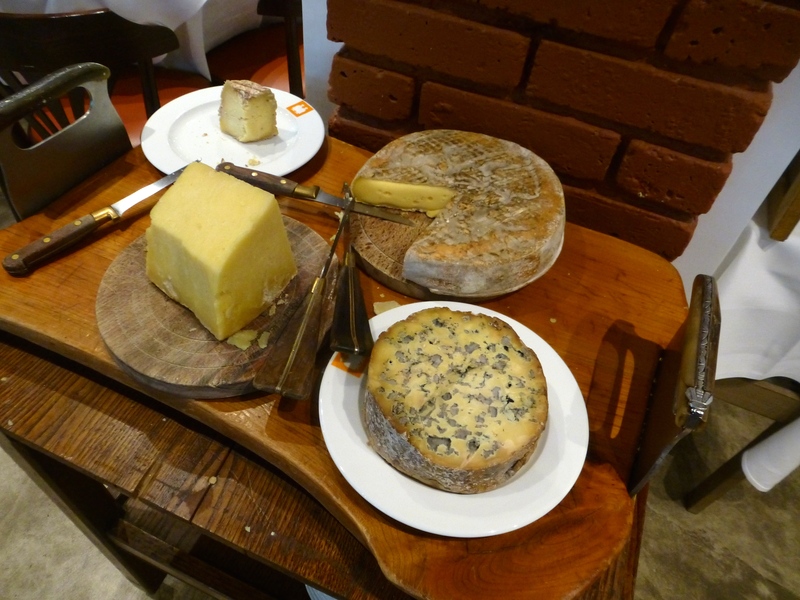 I photographed the local cheeses, which I didn’t try, on the way out. 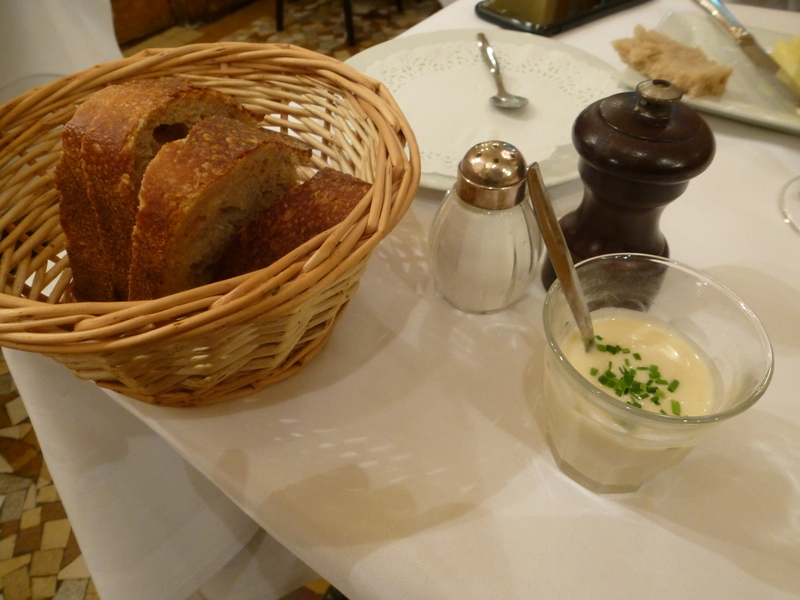 When I last ate here in 1989-1990, I was able to get down a cheese course before having two portions of mousse. Ah, to be young and hungry again! This entry was written by whyevolutionistrue and posted on November 12, 2018 at 10:45 am and filed under food, food and drink, food and wine, travel. Bookmark the permalink. Follow any comments here with the RSS feed for this post. Both comments and trackbacks are currently closed. 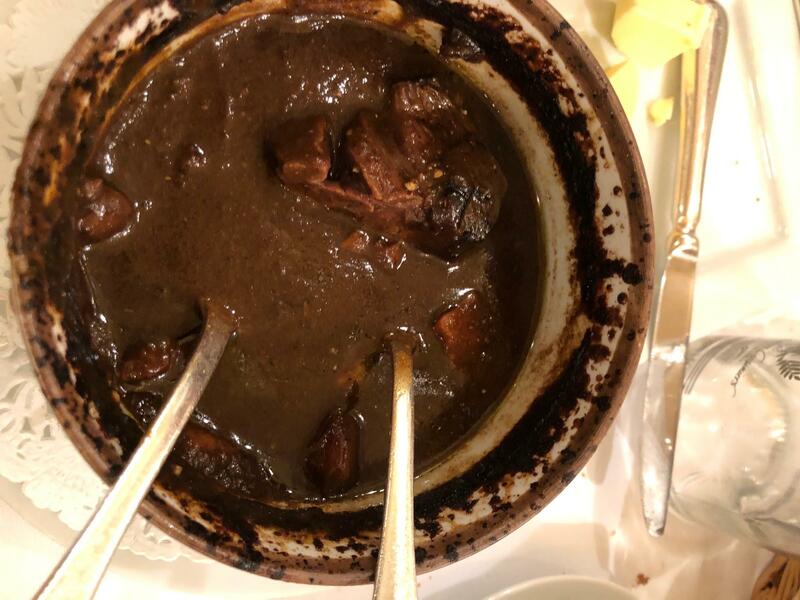 Why is a Beef stew like the present POTUS ? They are both rich ! and thick . Talking of the POTUS ,what a contrast your behaviour in Paris is ,to what he has been up to . You appear to have a genuine love for the city of Paris . Might sound like a brown nose ,but that is how it seems to me. Ham and green lentils! Heaven on a plate. All the rest looked great too. Don’t care for foie gras, but everything else looks awesomely delicious. 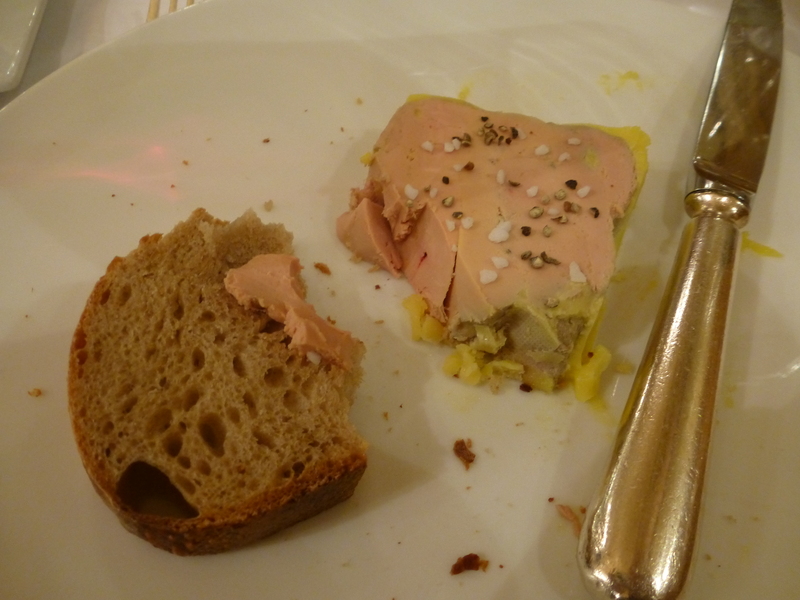 I’m a guilty lover of foie gras, with a good sweet white wine, although the Chateau Yquem is out of budget. Try a good Monbazillac at about a tenth of the price. I was going to lash out indignantly about the cruelty of foie gras. Thankfully, I found your comment & will tuck my ire here. You couldn’t resist, could you? I suggest you tuck your “ire” on other websites. 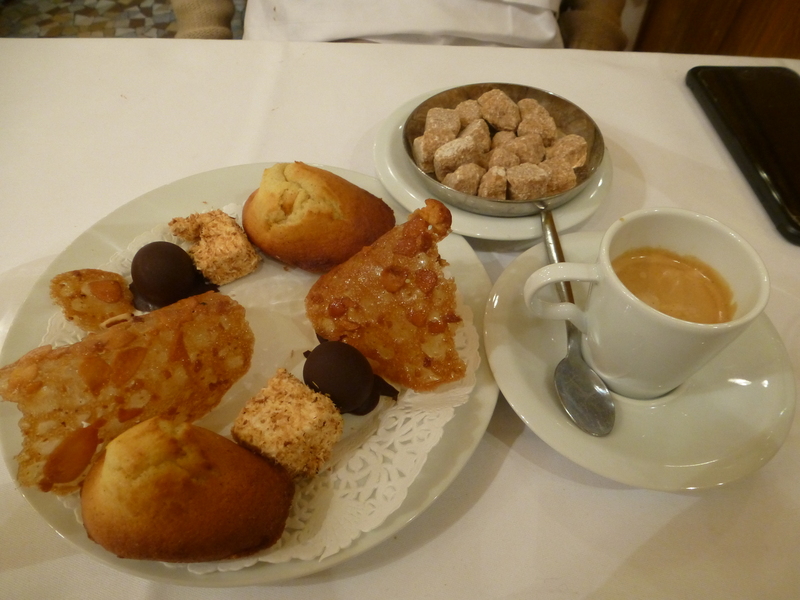 1) You are killing me with these Paris food posts. 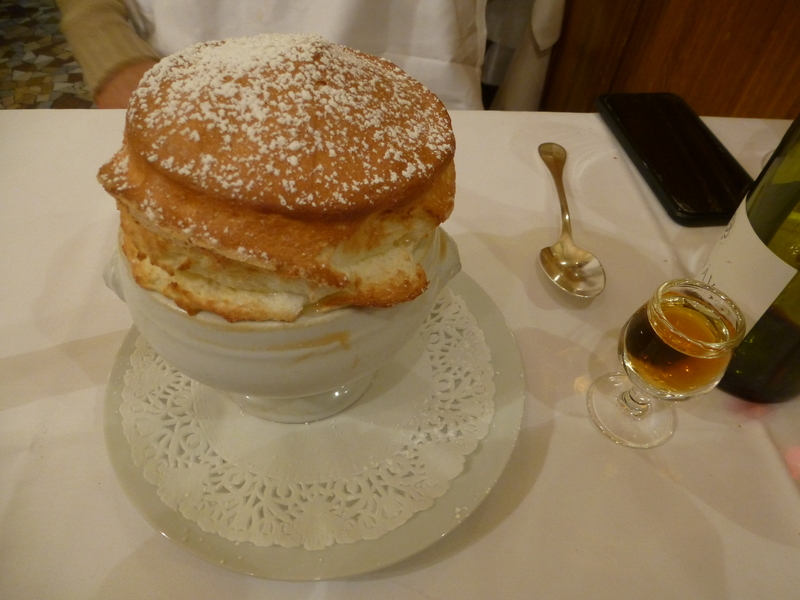 3) But, most especially with that soufflé Grand Marnier! 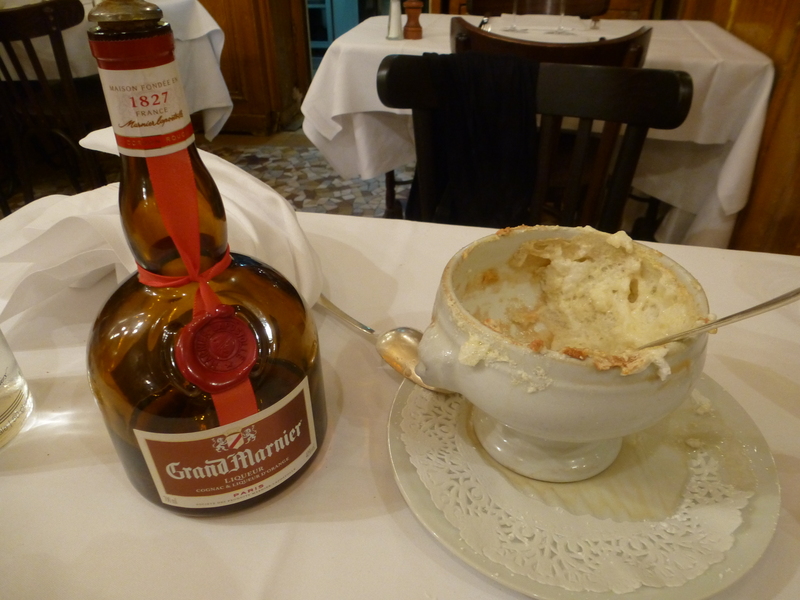 !1!1 I love Grand Marnier. 3 times in my life I’ve spoiled myself by splurging on a bottle of 150th anniversary Grand Marnier. Heavenly stuff. It’s been about 15 years since my last one. Might be about time to splurge again. Are you sure you can get it? The 1977 Cuvée Spéciale Cent Cinquantenaire I’ve seen at auction not on the shelves. I haven’t looked to buy a bottle in at least 15 years so for all I know it may well all be gone. A very sad circumstance if so! I may not be able to convince myself to afford what it may cost these days either. The 1st bottle I bought in the late ’80s or very early ’90s was about $180 US and the last bottle my wife bought me 15 or so years ago was about $300. You can get miniatures [hotel fridge 50 ml] for around $20 on ebay although I’m surprised it’s available in that format! And I’ve just seen a full size [70 cl] bottle going for £110 on Amazon which is too cheap – I suppose if you can get hold of the hand painted bottle it would be easy to fill with the standard stuff & sell for good money. Wine dealers are OOS, but were selling for 500 Euro. I wouldn’t buy as there’s no honour in the wine/spirits trade. Searching for a bit I have found many places that list it but none that aren’t out of stock. Prices range from $280 to $567! Looks like I’m out of luck. What does “corked” mean in that context? Surely not that neglected to remove the cork from the wine bottle. html stole my words from between angle brackets – intended to implt italics. It means that the wine has gone bad because the cork didn’t seal the bottle well. As I understand it, some favor plastic “corks” as they seal more consistently. Screw tops are modern, convenient, and probably more effective. I’m expecting all bottles to be metal screw caps in a few decades. The French, of course, will be the last holdouts. It means that the wine has picked up off-flavors from the cork. Apparently the culprit is usually a compound called 2,4,6-trichloroanisole (TCA, to the cognoscenti), which smells like moldy newspaper or wet dog, and – according to Wikipedia – can be removed by decanting the wine into a polyethylene container for a few minutes. ‘Corked’ in this context means tasting of the cork. Not nice. No restaurant that I know of would not immediately replace such a bottle. They don’t even taste themselves to confirm -that would be rude-, they just replace immediately. Anyway, FWIW, it’s a lovely film. Newbie’s technical question: How did you generate an Italic font in your text? Do a left caret, then an i, then a right caret before whatever you want to italicize. Then do the same after, with a slash before the i this time. Let me know if it works for you, John. Well, let us give it a try for the following text which should be italic How about that!!! And this thing >i< should come trough unchanged. Is there an HTML spellchecker or fixer to fix “through”? I don’t abjure; there is no way that WordPress comments can be edited afterwards. I’ve already checked and they say “no”. You get the content for free, so quit kvetching! I tried it once and it didn’t take. In the next line I’ll attempt to italicize “italics”. This is an example of italics. Did it work? The html there works here with the html that i know, like italics, and a few other simple things. Other web sites can use variations, like a [ instead of a <. I first saw and marveled at emojis here! All Unicode characters (within reason) should work fine. However, the HTML markup accepted in user-entered text (eg, comments) is another thing entirely as it depends on many things. Although HTML is a solid standard these days, what you type is subject to filtering and conversion at a number of levels. Without a definitive guide from the website itself, one is left to experiment. 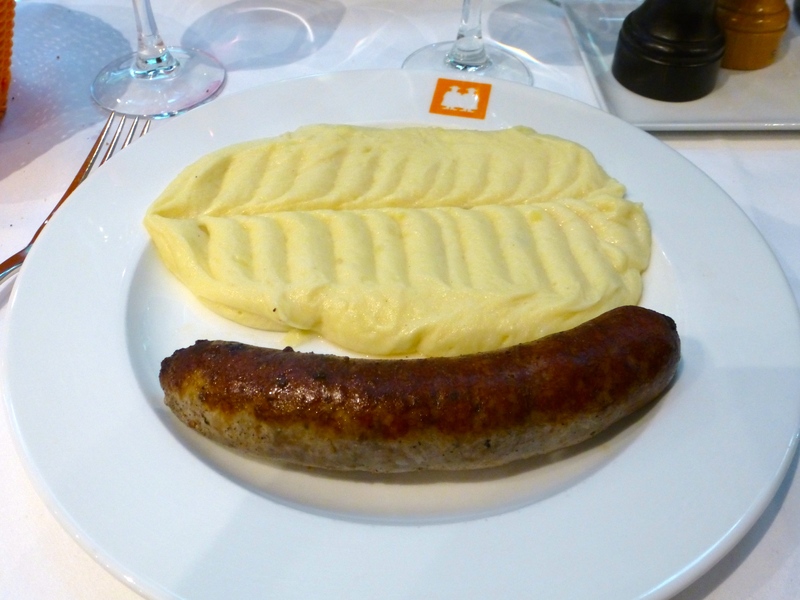 The aligot (mashed potatoes with copious lashings of melted cheese) is famous here, and I had mine with a local sausage. Does Honey know he eats foie gras? It gets worse: I think he ate duck breast the other day … drizzled in honey! Typo: ” bouef bourguignon “. That first word, meaning “beef”, of course, is spelled “bœuf”, or “boeuf” if you cannot get the typographic ligature with the software at hand (and these days, you can, because pretty much everything uses Unicode). Yes! The crunchy edges are one of the best parts of so many things, from souffles, to creme brulee, to brownies. You are so right about that! Gives me an idea for a new chain of restaurants called “Crunchy Bits”! Yummy! But I would be very nervous about slopping all over the pure white linens. 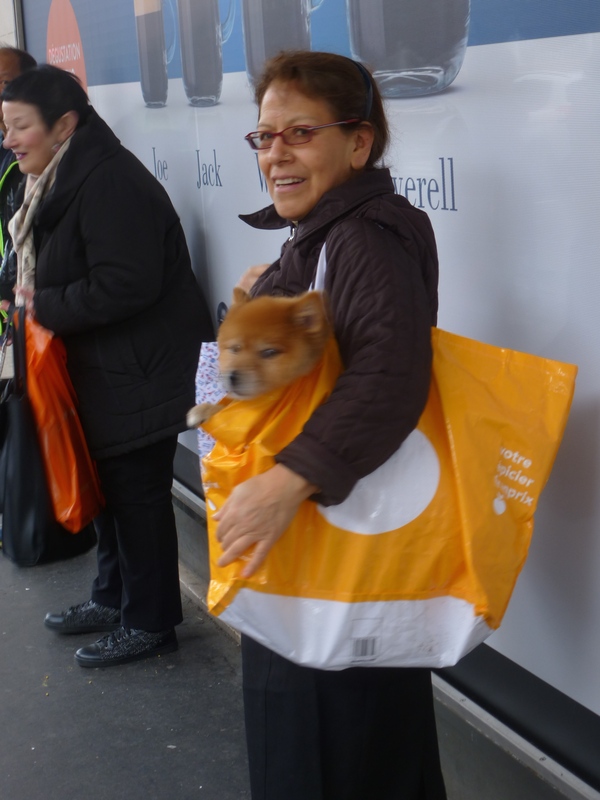 Is that really an ours in the sac de la femme? It looks more like some kind of chien. I agree. It looks like a shiba inu puppy. Sorry to be late withthis today, but jerry, if you read this in the morning, what is in the small dish in the middle of the salmon plate? Hopefully Jerry will notice and let us know. My 1st guess is that it’s Crème fraîche. It might be an aïoli, but I doubt it. 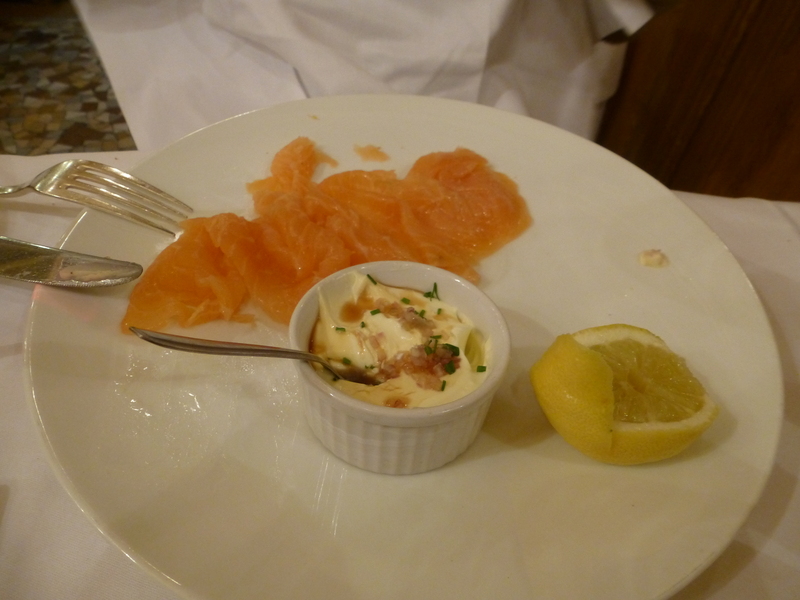 Salmon is rich and fatty already so more rich & fatty on top of that would seem a bit barbaric for a fine French eatery. Yes, I think it’s a creme fraiche mixture with some other stuff in it, and we didn’t put that stuff on the salmon after a first try, as the salmon was absolutely delicious with just a tad of lemon juice. Hm, I wonder if one can get the lentil salad without ham.